A mind blowing, breath taking, mind expanding experience in Ashtanga Yoga. This is a review of just 4+ months practicing Ashtanga Yoga regularly. It was November 2015 when along with Maria we were walking towards a DVD club to return a rented DVD related to a kids movie. We had just finished a 90 minutes workout at the gym. The road we took to the DVD club was one we have walked many times, however this time we noticed something new (for us). We saw a very elegant label outside a building. For some reason curiosity attracted us to see from up close what was that. We were surprised to find an Ashtanga Yoga school. The place was elegant and modest at the same time. No “bright lights” or “colorful extravaganzas” at all. Puzzled about what this is we opened the door. Well… that was it. It felt like “home”. I haven’t experienced that feeling for years. Last time it was when I entered an Aikido school I used to train for some years, around 12 years ago. So, a short simple talk and a trial lesson with Aris Kapetanakis and Dimitra Zavogianni and we started practicing Ashtanga Yoga in Porta Pandana Shala. In a month we totally abandoned weight lifting, treadmills, TRX, trambolin, etc. The meaning of the word “Yoga” is “union”. It is derived from the Sanskrit root “yuj,” (pron. “yug”) meaning “to join”, “to unite” but also “to subjugate”, with the meaning also “to control” and “to disciplinate”. Noticing some huge difference between those two explanations? Good. So, be careful what Google “knows”. Also the term “Asana” is translated to: Posture. Keep both these points. 4+ months of practicing have passed already and I would like to share some things. Here is my experience on doing this amazing different (for me) thing along with Zazen, Pranayama. Before listing the lessons learned so far, it is very important to mention that for Ashtanga Yoga a proper instructor is needed (as in for all things). Not just to show you the Asanas. 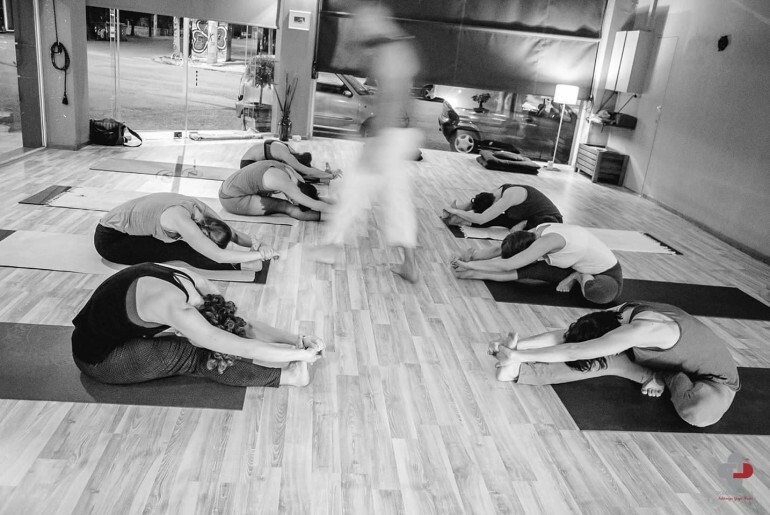 A proper instructor will gradually take you deeper into yoga showing you the road which you alone will walk. A proper instructor will “be there”. A proper instructor seems to grow along with it’s students. While I want to share my experiences so far, I find it a bit difficult to write lots of words. The reason for this is that almost all of these words can be summarized into the outcome of the state of “just being present”. Yet, that would be a rather sort post, right? Is it easy for you? Well, to be absolutely present is not something easy for me. Many things in my daily routine take me in and out from being present. In a machine gun rapid shooting rate, if I want to be accurate. In and out, in and out and many times it is like: out, out, out,… OK, I think you got it. It may be work, kids, financial issues, future plans, relationships with different kinds of people, eating, walking and a ton of more stuff. Yet in order to be able to have peace and enjoy things in life (along with ashtanga yoga practice) you just need to be present with what is happening. Yoga makes sure you will do so or you will not be able to practice properly. The thing is that as you listen to yourself while you practice you… focus. 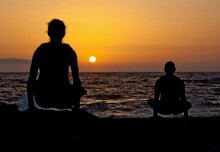 At the same time you “watch” yourself doing every Asana while you breathe in and out and by doing just that, you focus. This has side effects like: being more calm, smile while you encounter the limits of your body and see how these can be expanded. So, why not turning any daily turbulence into an observing and just-being-there mechanism? You may think of Asthanga Yoga practice, read about it, talk about it, argue about it, but eventually to really understand what it is all about you have to do it. I read things about it but before practicing it I had no hands-on experience. As the kind of people we all are and conditioned as we are, we tend to have opinions, ideas and prejudices for almost everything. Some times these are rather obvious to us and others. At the same time there are more that are subtle, managing our behavior and actions. So, for yoga and for all things, in order to know you have to dive into it, sometimes head first. Experience it. Confront it, while actually you confront yourself. Bored to put your shorts and go to the Shala? Just do it (thanks, Nike). Think not of it twice as what can you possibly learn by discussing this in your head? Get into the mood, even by ordering your mind to do it. Then do it. See what happens. Pour everything into it. Surrender and observe at the same time. Experience is gained by doing things, failing to things, winning and all over again. It never stops. My schedule allows me (so far) to practice yoga regularly, but I am not able -so far- to attend the extra Zazen class before the ashtanga yoga practice, all the times. So I do this at home for as long as time and things permit. I try to do it every single day. The simple meaning of Zazen seems to be: Just sit and breathe. Simple… yet is it doable? It seems to be doable if you manage to perform it every single day, while having no expectations on the outcome. So, what do you see after you sit, Chris (someone may ask)? I see me doing things. I actually see me. Not the outcome after doing things but as I do them. Seems that some things I repeat and I see them repeated, kinda fade from being repeated. No judgment of things as they happen. Judgment seems to recall or recreate or make bad clones of things. Simply seeing them seems to gradually accept them and dissolve them. Do I manage to see this all the time? No. Does it work when it I see it? Yes. For me this is a very joyful feeling. To see, seems to be, to remove. Sounds simple, right? We start in X posture and inhale, then move to the next posture and exhale, then we change to another and inhale and so on and so forth. But… observe your self during the day and outside of any ashtanga yoga yoga practice (for those who do any kind of life activities). Do we really breathe normally? When things happen during the day and the pace is fast or slow, do we breathe along with everything we do or do we hold our breathe, or maybe breathe in a shallow or deep or in a fast way? How breathing affects our body? Perhaps when we breathe in a shallow way our body gets more stiff? What happens in our mind before we breath like that or after that? Do we see it? What happens when we see a movie? Do we breathe in a deep relaxed way no matter the plot? What happens with our “life movie”? What happens when we have urgent tasks to finish in our work? When anxiety hits us with full speed? Do we breathe? What happens when misfortunes of life hit us. Do we breathe? Or maybe we hold your breath? I find myself into all these situations. It seems that some times (many times…) I forget to breathe or my breath becomes too short. Especially in situations where I am unhappy or stressed. At some points during the class practice you may receive an instruction from the instructor to help one of the classmates by pressing them down, putting your weight on them. From what I observed there is one correct way to do that. To feel their existence. Listen to their breathing. To touch them by simply wanting to help them do what they do. Seems like by doing that, this instantly creates a connection with the other person. There, as you inhale and exhale together (as it feels unnatural to not synchronize), the person receiving and the person applying the pressure instantly work together to expand the body limits, only to find that a body is actually more flexible and adaptive with just a bit more pressure applied at the right time, in the right way. Both, learn. Lesson 6: Best thing happened: Got injured! It is not like I suggest to everyone to get injured, right? In my case, perhaps it was the extreme enthusiasm or getting eager for getting better, or simply put.. not being present to what was happening. Despite the instructions from my instructors to go as far as it goes I wanted to push to go further. I wasn’t ready, so a part inside my body complained. So I got injured. If you ever being doing any kind of “athletic” activity you know that injuries happen. So, I thought that I would have to rest for a few days, however Aris (and a variety of yoga articles) suggested that I must go and practice and this will help the healing. In a weird way it did. Seeing by myself that after I “rested” for 3-4 days, things didn’t seem to become better I decided to go for practice again. I went in smoothly doing as far as I could do. I listened to my body better after that. Seems like I did not (duh!). My body told me exactly “how far” to go through the injury on my leg muscles. Which of course was applied as a logic to the other leg. To see how far it can get without straining it extremely, as a result of my eagerness to “do more”. Pain is a tutor. Pain showed me the feelings I had for not being able to perform as I would like to. At first few times it was annoying to my pride but then after a few ashtanga yoga classes it somehow became an amusing thing to observe this way of thinking. Another thing on how mind works. The pain I had was in 3-4 different areas around a main one. Possibly all reflected from a single point but this is how I felt it. What I noticed was that after a number of classes I had the memory of the pain in some areas but there was no actual strain in these areas. My mind was recalling the memory of the pain in that area. Yet, when I was concentrated in those areas there was no pain at all. Though, in another level I found that my mind was giving instructions to my body to block my practice. Sounds ridiculous, right? I mean it is my mind! I order my mind! Who controls my mind? Me, me, me! 🙂 Muscles don’t think of themselves. Right? “Wow Chris! Contract that muscle. Don’t you afraid that you will get hurt? Avoid that or you may get uncomfortable. Don’t do it! Do the simple one, stay there!”. This happened in the speed of light. Now, I know what some will say: Perhaps it was your intuition. Well yes, this happens too but in these cases like the one I describe here it was not. It was my mind, through my fear of “survival” and not getting one step outside of my comfort zone. What I actually had to do in that ashtanga yoga asana was to let my my body relax and naturally expand. But my mind said to “shrink”. So, I couldn’t do it and had more stress on my muscles due to that! It was quite liberating to observe that I knew (at least at the novice level I am) what stance to take and the same time “I” was not letting that happen! The actual thing I had to do to perform the posture was the thing I was blocking from happening! Makes you think, right? I am lucky in life to have gone through a lot of psychological training by exploring the mind and psychology through very different disciplines. Some were painful as they happened, yet they proved very important as years passed. Through such I -so far- understand that people do not want to suffer and they seek ways to remove/revert that and understand life. At the same time many “promises” fly around which “guarantee” such. Seems the approach of seeking a way to remove “difficulties” is part of the problem. Life seems to be just… life. Of course it seems unpleasant and painful and even tormenting to go through its challenges every single day yet this seems to be life itself. On the other hand, happy moments are more easy to “digest” and enjoy. Yet, if that is life do we really live it? Do we really embrace all these things as they happen? And if we want to find the “paradise lost”, perhaps we need to simply listen to ourselves constantly? To observe what we think about all the time? Could it be just in front of our eyes? Perhaps “wishful good positive thinking” does not do the job. Things may need to be approached from a different angle. That of observing. For example, through allocating 20-30 minutes per day, to just sit quietly and simply experience what you think about anything gradually makes all these thoughts a “boring” thing and they wear out? Seems like they wear out as we see that they are just thoughts. Like they have no actual ground. Of course we may found ourselves in the “surprising” discovery that we resist change and somehow we “feel that we need” these thoughts as it seems painful to replace them with something that we haven’t really experienced yet. The great unknown! Meaning… Life! Can this lead us outside of a complex way of thinking and therefore solutions can occur or show up? Perhaps they were there all the time. I find that this thing works. I mean to just going through situations that test your limits and show you what you are and at the same time change you through that process. Is there any point into thinking what other people are? They all go through situations in life. Of course, with those we relate with, pain or pleasure, is experienced in a different way but that’s that as it is. No biggy or small thing. It is just that. It happens. So, I wonder. If we become to experience the process of life then how far enjoyment of this process is, since it is just a process? I have no idea if such a process leads somewhere “higher” or in an “enlightened state” or such. I have no solid idea what this means and I am pretty sure so far (from my experiences) that almost all that say they do, know nothing. Nobody can actually transfer his knowledge to someone. What is actually transferred are questions and they should be kept like that to allow people to observe by themselves. So, these are my experiences so far by practicing Ashtanga Yoga and Zazen. Now, you may think that you read an article on lessons learned through doing yoga, that may apply only in relation to yoga. But, is it like that? If you remove the term “yoga” from all over the article maybe it applies to more things related to the psychology of each of us? Enjoy, and do share this article if you find it helpful.